Yordie: Ok, I wrote an ending for my story, a final post for this blog. I liked what I had written and felt it was even a graceful exit. Then I began mulling. I started considering comments that friends had made about closing this blog. Also, I considered that some friends didn’t understand why I was ending everything. And then I struggled with what the purpose of this blog had been. There was a lot to mull. When I first started blogging, one of the first blogs I followed was Joonie Jatho’s story. Joonie was very open about her feelings. She searched for meaning in her second life. In fact, I think most Second Lifers find themselves searching for meaning and purpose here, most just don’t write about it. Anyway, Joonie felt she needed to close that first blog and I was sorry to see it go. Fortunately, a short while later, she created a new blog. I took that to mean she enjoys the self-expression her blog gave her. The point is, I think I’m at a pivot point similar to Joonie. I need to create an ending to my story, but I’ve reconsidered shutting down this blog. So, no, I won’t close this blog. The thing I kept realizing there are many topics I enjoy writing about. And I resolved that my sense of vulnerability could be eliminated by simply eliminating my ramblings about my romantic life. 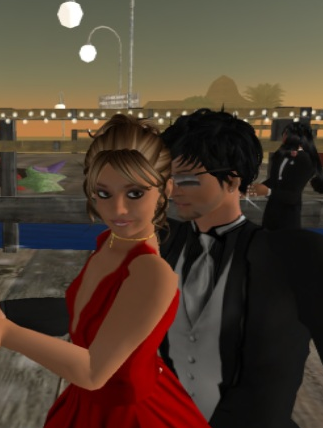 I’ve said that in the past, but going forward I’ll focus on exploring new lands, shout outs for great inworld performers, messing around with new fashions, reporting on fundraisers and other events, and many other topics. I may even write another story, but it will have a different point of view. I still need to end my story, this is a personal thing, but this blog can continue to exist. Below is the story’s end, written by my human, with love and… well, I left out the squalor. Yordie’s Human: When I realized it was time for an ending to this story of Yordie Sands, I thought that would require a reaching back in time and pulling together the many people and places and tales. But I came to realize this story could ending something like the story of The Samurai & The Geisha, on a bright sunny day. When I created Yordie Sands she meant nothing to me. She was just another in the endless stream of female avatars in purple t-shirts & jeans being generated every day in 2007. Her purpose had nothing to do with SL romance. And I was just another human exploring what was a very buggy virtual world. It wasn’t until an inworld girlfriend explained SL romance, that I realized such things were even going on here. Inworld romance seemed odd and very impractical to me. So, I just continued to explore, looking for a purpose. dancing with her first boyfriend. Yordie explored, but there was a point in time when Yordie began to mean something to me. There was a night when I tp’d Yordie to our first nightclub discovery. The club was called PIER and that’s where she learned to poseball dancing. hehe. PIER was a wonderful, friendly club sitting out over the virtual sea. On my first visit I just listened to music and watched all the goings on. But on that special night, PIER and its’ peeps made me feel especially at ease. The moon was hanging in the sky. The DJ was spinning the perfect tunes. I was immersed in everything I saw, then magic happened. I felt myself one with my avatar. On that special night, I didn’t need to be me, the real life person. I realized that this girl I was creating, this avatar, was a representation of me. She was a representation of my sense of beauty. And I discovered that I was able to be Yordie Sands. People who don’t feel that sense of connection to their avatar aren’t likely to understand me at all. Yes, it’s like playing Barbies and pretend. But for me, the alternative is to remain an observer, a person sitting in a chair at a computer, texting and tapping off mouse clicks in a “glorified chat room.” I chose to immerse myself in the life of my avatar. Yordie Sands and I are very similar in many ways. Yordie is someone I wanted to be better than myself. I wanted her to be kinder and more considerate. And I wanted her to encourage others to be whoever they want to be. I wanted to experience my second life as Yordie, as the heroine of my virtual fantasy life. I’m happy to say, Yordie has had a good life. She has explored vast regions and participated in amazing events. She has played roles as a geisha amd hostess at a blues club. She even created a popular Zen garden. Yes, she danced and pranced and romanced way too much. But most importantly, she’s found good friends. Yordie has experience many highs and lows, but the truth is, she wouldn’t be who she is without those experiences. The best day of Yordie Sands’ life is unquestionably the day she married Takamatsu, the wedding. It was a bright sunny day. 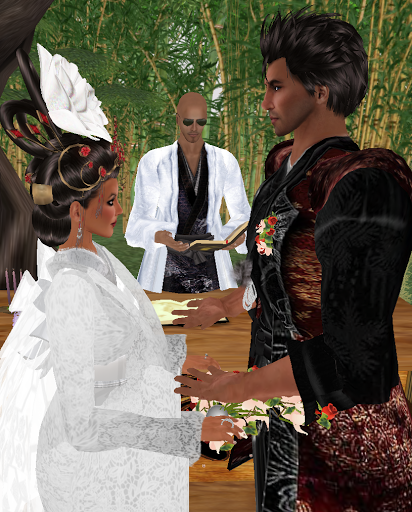 The dearest people in Yordie & Taka’s second lives came to honor them as a couple. Yordie has never been so in love, and never felt so loved. How could there possibly be a happier ending than that? Unfortunately, I didn’t know I should have ended the story on that day. If I had, many wonderful things would never have happened. But if I had it would be a perfect ending for my story. Taka and Yordie have gone their separate ways, but the joyfulness of that day wasn’t destroyed by the hurt and sadness that followed. Yordie Sands lived that day and if she were to die tommorrow, that day would always be the happiest moment of her life. And that’s why, this is how the saga of Yordie Sands should end. Just so you know, I’m very hopeful about Yordie’s future. Yordie is reinventing herself and she’ll be back writing about the things she loves soon.